eQSL Factory helps automate the production of electronic QSL cards (eQSLs). Load in the background image file, position your text fields, and you're all set to go! eQSL factory can import in reporter details from the clipboard and, using special field definition text, automatically paste those details into the correct text fields on the eQSL. You can even keep track of the QSL number and increment it. The best way to understand how to use the app is to load a sample file. I'd suggest loading "Test File" first. Start the app and open this file from the File menu, or drag and drop this file on top of the eQSL Factory app to launch the app and open the file. 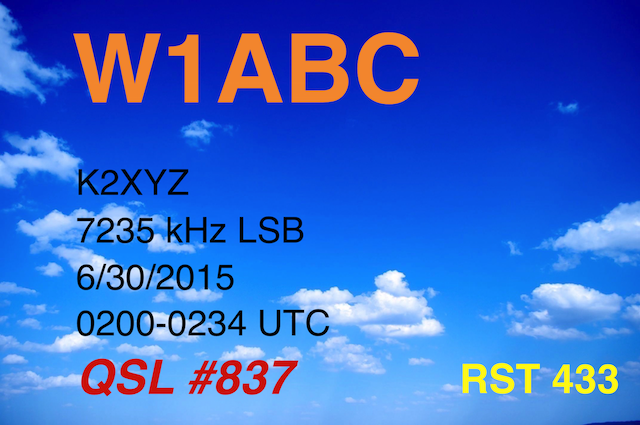 You'll see the sample eQSL, with several text fields already filed out. There's a list box in the lower left part of the window, with an entry for each text field. Click on each field, and it will be highlighted in the eQSL image, and the various fields in the upper left part of the window will be filled in with the details for that entry. You can edit the entry using them. Most of the settings should be self explanatory. The "Name" field is what appears in the list box, it does not appear anywhere on the eQSL itself. You can customize the eQSL by editing the text for each field. Once your eQSL is done, you can select Copy Image from the Export menu to copy it to your clipboard, then you can paste it into an email or text file. You can also save the image as a GIF, JPEG, or PNG file by using the other items in the Export menu. Be sure to save your eQSL information by using Save from the File menu, it won't be automatically saved when you quit the app or close the file, if you have made any changes. Now for the real power of eQSL Factory - the ability to quickly produce eQSLs by automating the process! Request that your reporters include their pertinent information (name, date, frequency, time, RST, etc) in a specific format. There are several lines of information. Each is preceded by the field name, which always starts with two dollar signs, and ends with a colon. Then following the colon is the actual text. Your eQSL template then includes these field names in the various text fields. When you copy the above text from a report, and import it into eQSL Factory, the text will be automatically placed in the correct fields. The best way to see how this works is to look at an example. Load the Text File 3 onto eQSL Factory. You'll see the eQSL image, along with he text fields, many of which contain $$ field names. This is where the text from a report will go. Now select the above report, all five lines beginning with $$ and then select Import Report from the Import menu in eQSL Factory. The report information should be automatically added to the correct text fields. Now instead of it taking many minutes to make a custom eQSL, it only took seconds! The five fields used here are just an example, there is no limit to the fields that can be used. Your reporters however need to know what fields to provide data for, so it is suggested to use a standard like this. QSL numbers can auto be automated. If the text $$NUM appears in a field, it will be replaced with whatever is in the QSL Number text entry field in the app. Clicking on the increment button will advance this number by one. You can also directly edit the field to change it. Be sure to save your template file if you have changed the QSL number (or anything else). Note for Windows users: eQSL Factory needs the DLLs in the eQSL Factory Libs folder, so be sure to keep it in the same directory as the app itself. eQSL Factory is under development, and is presently free to try.